Irresistible Commanders Palace Garlic Bread is quite possibly the best garlic bread served at any restaurant. On a recent trip to New Orleans, I was lucky to have this amazing garlic bread. There is something that everyone loves when a tray of fresh and hot bread is placed on your table while you wait for your food. So often the bread is plain, but not at Commanders Palace. 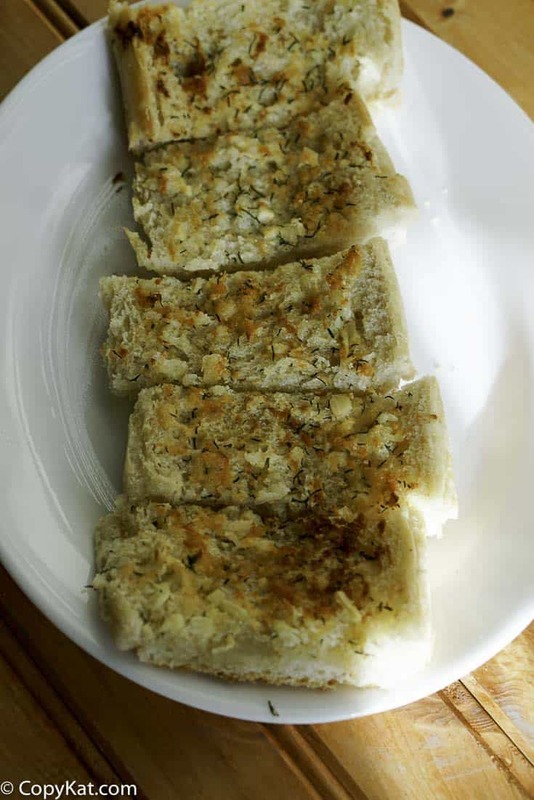 At Commanders Palace you receive this amazing garlic bread. Their bread is a little unusual, and I think it is the addition of a couple of ingredients that make it extra special. What do they add that most people do not add to garlic bread? Parmesan cheese and dill, if you are like me, I can go along with the Parmesan cheese, but the dill is unique. While I couldn’t believe my eyes when I first glanced at the bread, I was soon won over by the delicious bread. I will say in New Orleans the French bread there is different. The bread is crispier than what you normally find. The loaves of extra crispy bread add the special touch to the Po Boys, and of course, to this bread. So my advice on this is to buy the freshes loaves of French bread you can get your hands on. Day old bread doesn’t have the crispy crust it has on the first day. It’s even better if your bakery doesn’t shove the bread into plastic bags, but while it is a minor point, I prefer to buy French bread made that day, and when they stick it in paper bags. Let’s go over the other ingredients, you will need to use real butter, please no margarine. When you bite into a piece of the garlic bread at Commanders Palace the flavor of real butter infused with the perfect amount of garlic is what you taste. They also add Parmesan cheese, I would suggest that you grate you own fresh cheese for this recipe. The stuff in the green can have its place, but it isn’t here. You want some cheese that has a nice depth of flavor, so be sure to buy a small hunk of the Parmesan cheese. I love what the folks over at the Food Almanac said, how much garlic bread you think you will need, you should double that. Their second comment is how much garlic bread do you want to put on the bread, is for you to put a layer on the bread, and then do it again. 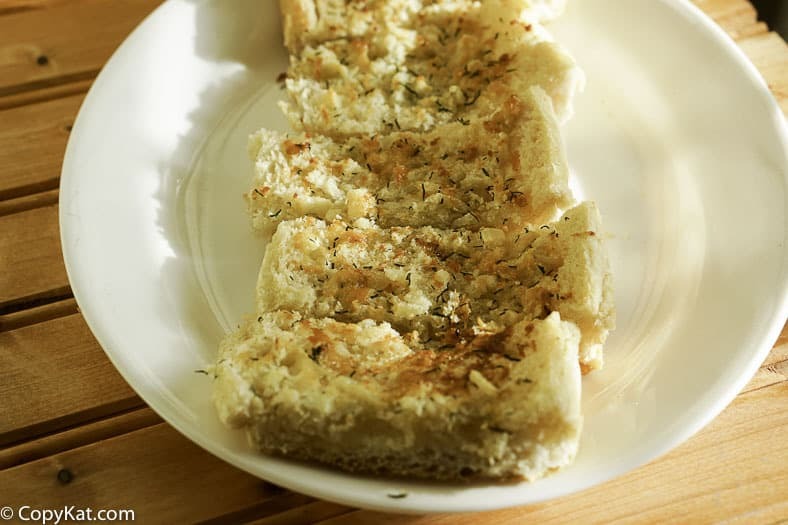 So while you enjoy this delightful garlic bread, you should try some of these other New Orlean’s inspired recipes. You can enjoy Commanders Palace Garlic Bread anywhere. Preheat your oven to 375 degrees. In a small saucepan, heat the butter with the minced garlic. While the butter is melting, cut the French bread lengthwise and place on a baking sheet. When the butter has melted continue to heat until the garlic becomes fragrant. Add the dill to the garlic butter. Brush the garlic butter onto the bread, this is your first layer. Sprinkle the cheese onto the bread. Dot the remaining garlic butter onto the bread. Place the bread in the oven cook the bread for 15 to 18 minutes or until the bread begins to brown. Slice the bread and serve immediately. Made this along with the Olive Garden Alfredo Sauce and everyone loved it. What a deliciously great idea! Pinned this one! Thanks for sharing for our Dinner party! Have an awesome week.